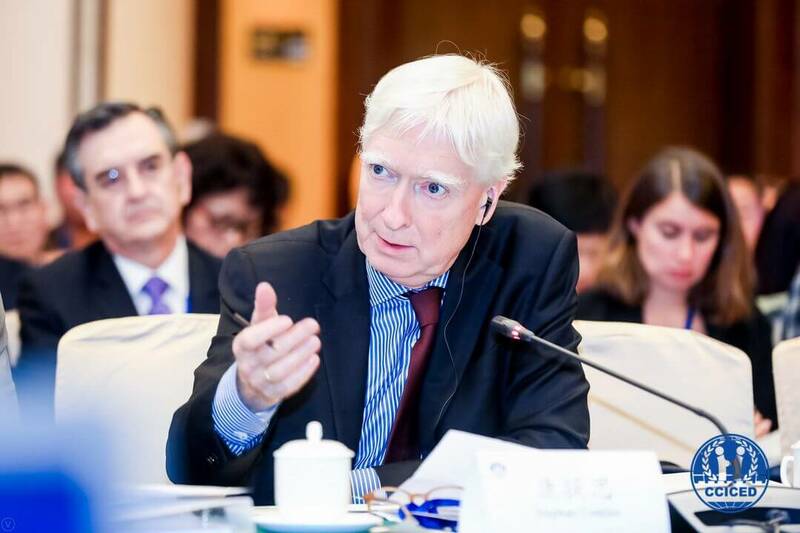 The 2018 Annual General Meeting (AGM) of the China Council for International Cooperation on Environment and Development (CCICED) was held from November 1st to 3rd in Beijing under the theme “Innovation for a Green New Era.” AGM participants included Chinese and international members of the CCICED, its special advisors and a number of observers, who witnessed high-level discourses and updates on various Special Policy Studies. Furthermore, the more than 2000 participants considered the 2018 CCICED Issues Paper as well as the Council’s draft policy recommendations to the Chinese government. 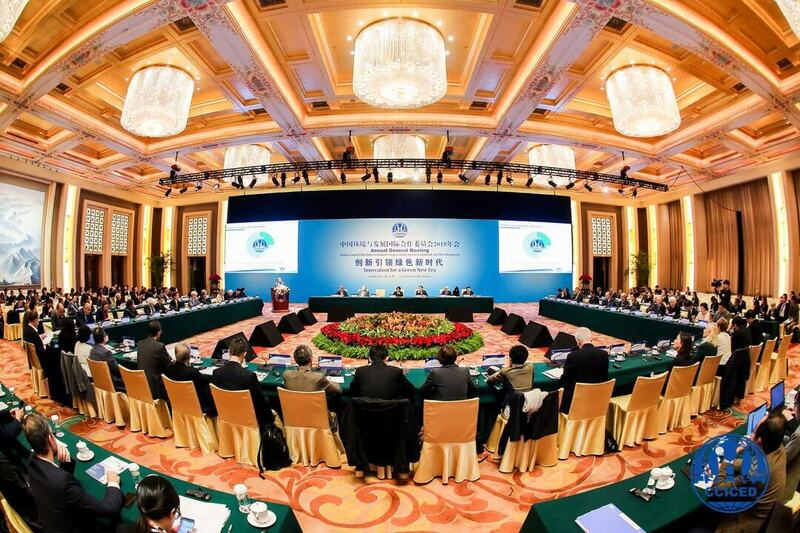 During the AGM eight forums and one round table took place, focusing on topics that include biodiversity conservation, climate change, green Belt and Road Initiative, green consumption, and marine governance. GIZ supports the CCICED on behalf of the Federal Ministry of the Environment, Nature Conservation and Nuclear Safety (BMU), since its establishment in 1992. The next AGM will be held in June 2019 in Zhejiang Province. The Sino-German Environmental Partnership supports the CCICED Special Policy Study – “Goals and Pathways for Environmental Improvement in 2035” – led by Maria Krautzberger, the President of the German Federal Environment Agency (UBA) and also a CCICED Council Member. 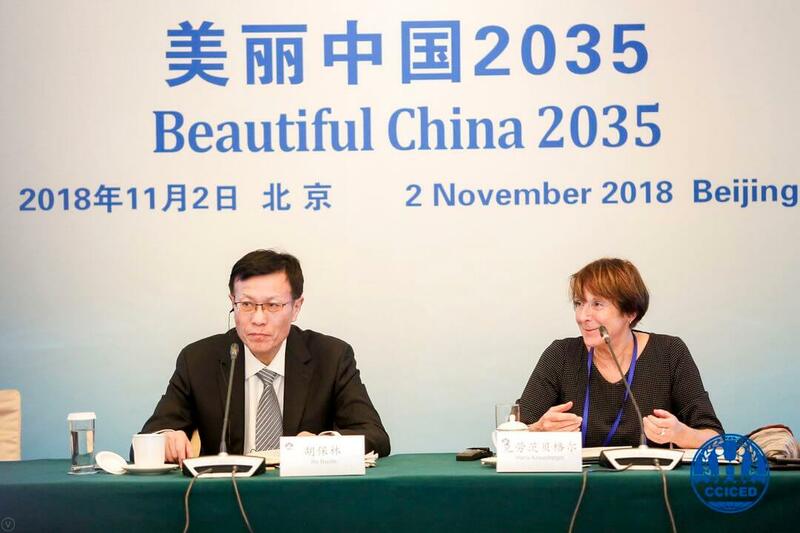 Maria Krautzberger also co-chaired the forum on “Beautiful China 2035” during the AGM, together with CCICED Special Advisor, HU Baolin, which was also supported by the Sino-German Environmental Partnership. During her opening remarks, Maria Krautzberger emphasized the importance of the reliable management of chemicals and waste for China’s Green Transition. She stated that “the sound management of chemicals and waste should cover three key elements: the life cycle approach, the prevention approach and the contribution to sustainable development.” Chemicals are a part of our daily lives and chemical consumption is on the rise. As a major contributor, the significance of chemicals should, therefore, deliver a good example to promote green transition. The discussion during the forum focused on China’s 2035 target to fundamentally improve its ecological environment and achieve the objective of building a “Beautiful China.” Participants considered objectives and indicators for improvement of the ecological environment and needed innovations in institutional reform and policy formulations. 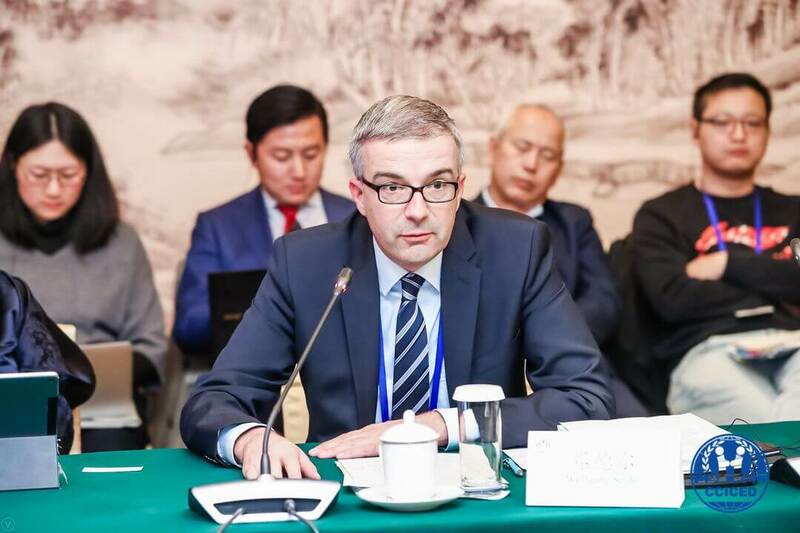 Commissioner for the 2030 Agenda, Head of the Division for United Nations, 2030 Agenda, Cooperation with Developing and Newly Industrialized Countries for the BMU, Stephan Contius, participated as a CCICED Special Advisor in the forum “Green Belt and Road Initiative (BRI) and the SDGs.” The forum was co-chaired by LI Ganjie, the Minister of the Ministry Ecology and Environment (MEE) and Erik Solheim, the executive director of UN Environment Programme (UNEP). Discussions during the forum focused on green investments, low carbon approaches, and green electrification. The group agreed that UNIDO will present the outcomes of the forum to the CCICED AGM in 2019. Moreover, on November 1st, Stephan Contius participated in the round table “Partnership Development for Low-Carbon and Circular Economy”. The round table discussed challenges and measures in setting up innovative governance mechanisms and the roles of business communities in green development and partnership development for low-carbon and circular economy. The commissioner highlighted the resource efficiency dialogue established under the German G20 Presidency and the continuous work on these themes by the current Argentinian and incoming Japanese G20 Presidency as well as Germany’s support for the Partnership for Action on Green Economy (PAGE). Wolfgang Seidel, Head of Division, President Office, UBA, participated in the forum on “Green Consumption for Green Transformation.” During his speech, Wolfgang Seidel accentuated eco-labels, such as the Blue Angel. Germany has a long tradition and practical experience in eco-labelling. This year, the Blue Angel celebrated its 40th anniversary and the eco-label has already been applied in China. Through cooperation and mutual learning, like with the eco-label example, more sustainable consumption and production is on the way, Wolfgang Seidel concluded. In addition, the forum also discussed resource and environmental problems caused by “irrational” consumption structures and patterns. Participants discussed the overall process of green transition, as well as strategies, priority areas, legislation and policy instruments for promoting green consumption.